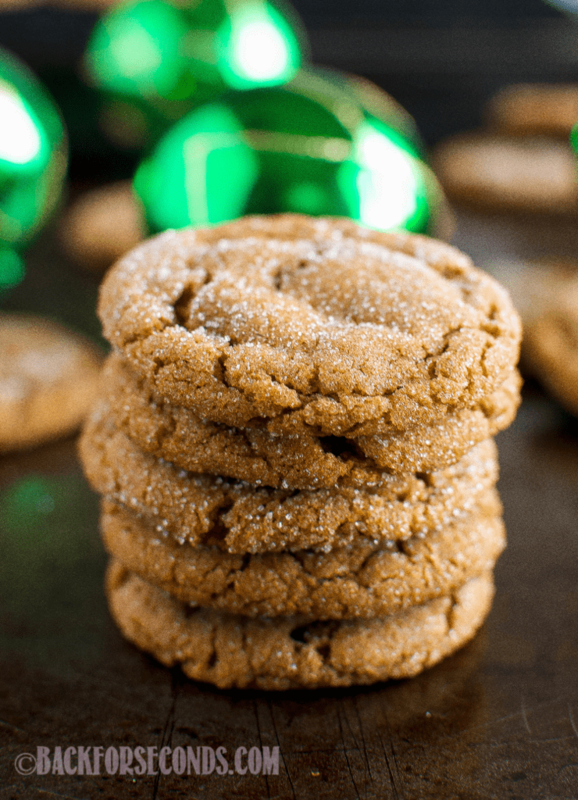 These are the Best Chewy Molasses Cookies ever, and a must make Christmas cookie tradition! 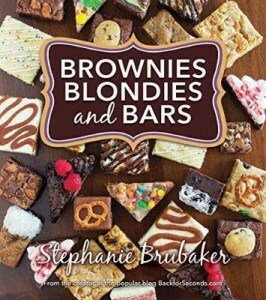 The perfectly crackled tops and chewy insides are irresistible! These amazing cookies have earned their place on our Christmas cookie trays every year. I have been making them for a long time, tweaking the recipe a little each time until they were just right. No more tweaking necessary – these are truly the best! My husband and kids all LOVE these cookies. They have the perfect amount of warm, comforting spices – they basically taste like a Christmas hug. 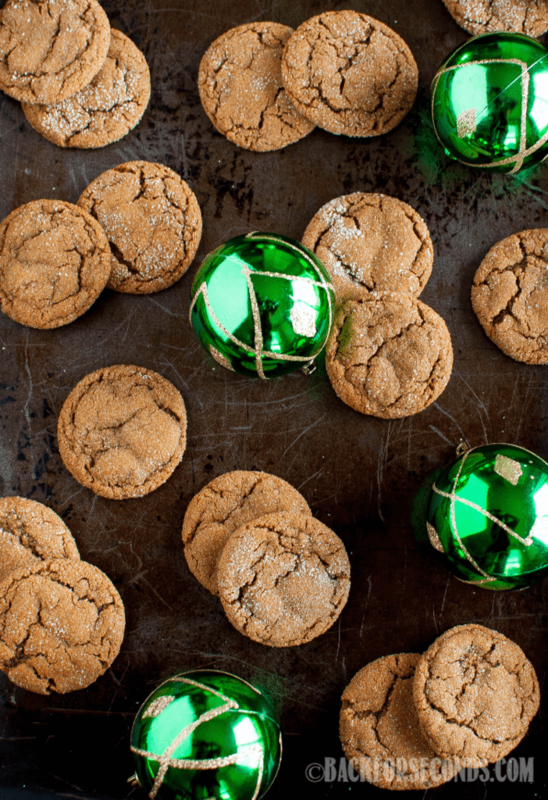 What are some of your favorite cookies to make each Christmas? Our list has become quite extensive, as we’ve had more kids. I think we made 20 varieties last year! 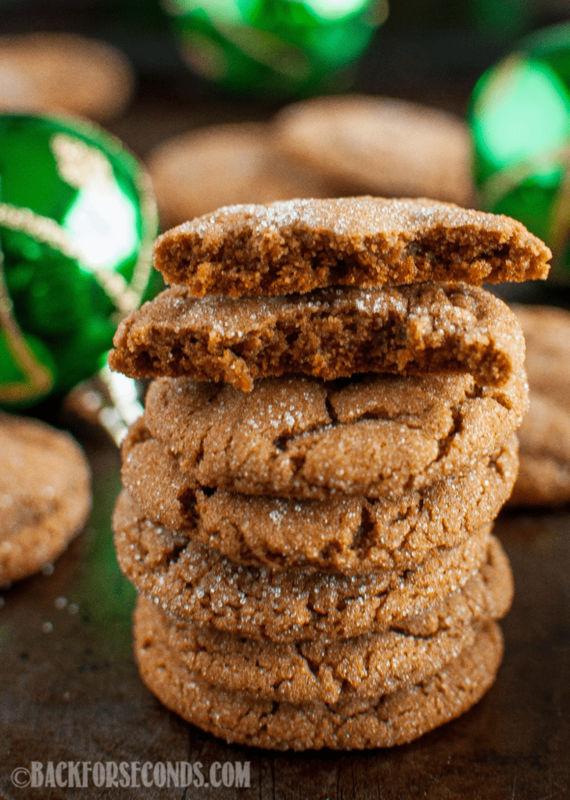 The flavors of gingerbread are a newly, much requested favorite around here. These Soft and Chewy Gingerbread Bars with Eggnog Frosting were a huge hit last year, and my kids have been asking me to make this Gingerbread Fudge all year long! 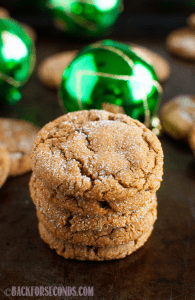 The combination of ginger, cinnamon, and nutmeg is just such a cozy combination. There’s not much better than watching snow fall outside your window with a nice hot latte, and a plate of these Chewy Molasses Cookies! Comfort and joy! 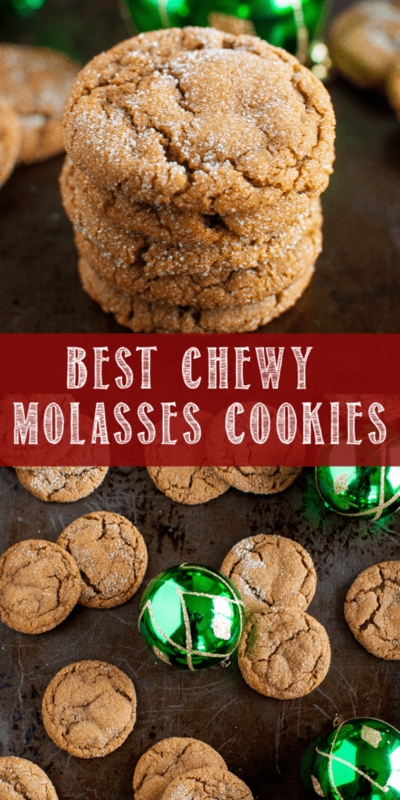 These are seriously the Best Chewy Molasses Cookies ever! They are a must make Christmas cookie that everyone loves! The perfectly crackled tops and chewy insides are irresistible! Mix in molasses and the egg until. Add in the cinnamon, nutmeg, ginger, salt, and baking soda and mix well. Roll dough into 1 1/2" balls and roll them in the granulated sugar until coated. Place dough balls 2" apart on an ungreased cookie sheet. Let cool a few minutes on cookie sheet before transferring wire racks to cool completely. *Back for Seconds is a participant in the Amazon Services LLC Associates Program and may earn a small commission on products purchased through these links. There is no added cost to you. 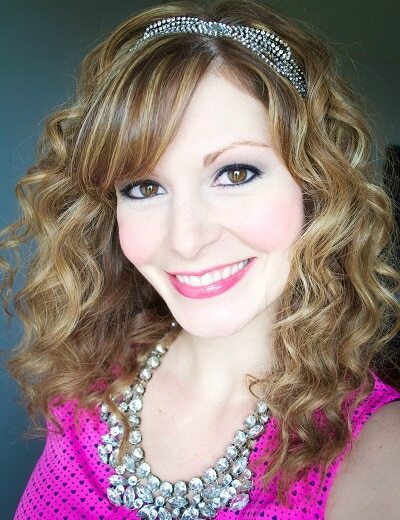 Thank you for helping support us so we can continue providing you with free recipes! What temperature did you cook these on? One tablespoon is correct. More than most cookies, but these need it 🙂 Enjoy! Good morning! You mention these are freezable. Is that before or after being baked? I am in need of freezable dough to make it easy for when the grandchildren come to make cookies for Santa. Looking forward to your reply. Wishing you and yours a happy Christmas season filled with great health, loved ones, laughter, and tons of fabulous memories. These are amazing. My husband even said better than chocolate chip! Thanks for a superb recipe! Can you chill for longer than 2 hours?? Mine came out flat and thin. They tasted great but didn’t look like yours. Any suggestions? Sounds like they needed longer chill time, or even a little more flour. Hope you make them again – these are our favorite cookies! Do you have to chill these in the refrigerator for 2 hours? Yes. Chilling helps keep the cookies from spreading too much!